At a tribal jail in Washington state, an inmate with a broken leg banged on his cell door, screaming for pain medication, only to be denied. Hundreds of miles away, a diabetic man jailed on the Wind River Indian Reservation in Wyoming needed insulin, yet government records say authorities were unable to get any for him. And jail staff at other reservation lockups on several occasions mistakenly gave inmates the wrong medication. These episodes, and dozens of others noted in limited detail in 2016 jail incident reports collected by the federal government, underscore what health professionals and jail administrators describe as a deep-seated problem: Scores of federally funded jails on reservations have no in-house nurses or other medical staff, often leaving corrections officers to scramble in emergencies to determine whether to send an inmate to the hospital, or provide basic care themselves — sometimes with unfortunate consequences. Jail data collected by the U.S. Bureau of Indian Affairs from 2017 was not yet available. A spokeswoman for the Public Education Department did not respond to requests for comment on Phillips’ firing. Attempts to speak to Phillips about her letter were unsuccessful, too. The department’s website still lists Phillips as the assistant secretary for Native American education. It also lists her as a member of the Tohono O’odham nation. For Native Americans at the Roundhouse, the annual American Indian Day, celebrated on Friday, is a day to commemorate the struggle Native politicians have endured to find their voice in a predominately non-Native Legislature. Tribal leaders who moved to establish formal governing institutions or processes for their communities in the United States initially established relationships and forged agreements with the federal government. It wasn’t until the 1980s that Native leaders began to turn their attention more fully to developing stronger voices within state houses. The Reagan administration during that decade made dramatic cuts to social welfare programs, including funding that provided health care and other services to tribes. Reagan’s policy toward American Indians was in line with his general philosophy of moving resources and decision-making authority to states rather than centralized federal control. “This whole state’s rights agenda really forced a relationship where there was no Indian policy, there was no delineation of any shared responsibilities between the state and the tribes,” Regis Pecos, co-director of the Santa Fe Indian School Leadership Institute, said. ALBUQUERQUE – With cuts and bruises on his face, back and shoulders, Jerome Eskeets frantically told police about the violent assault he barely survived the night before. In his 30s, Eskeets had been sleeping in an empty lot on Albuquerque’s west side with friends and relations, Allison Gorman and Kee Thompson, who like Eskeets were Diné, as members of the Navajo Nation call themselves. Soon after talking to Eskeets, police found Gorman’s and Thompson’s bludgeoned bodies. The 2014 crime shocked Albuquerque, the state and occasionally made national news as the cases against the three defendants eventually arrested in the brutal killings — youths Alex Rios, Nathaniel Carrillo and Gilbert Tafoya — worked their way through the court system. Three years later, the judicial system is nearing an end to the case. As tribal members dig in their heels to prevent construction of an oil pipeline they say threatens their water supply and damages sites sacred to them, a growing police action in North Dakota over the weekend has landed many of them in jail. 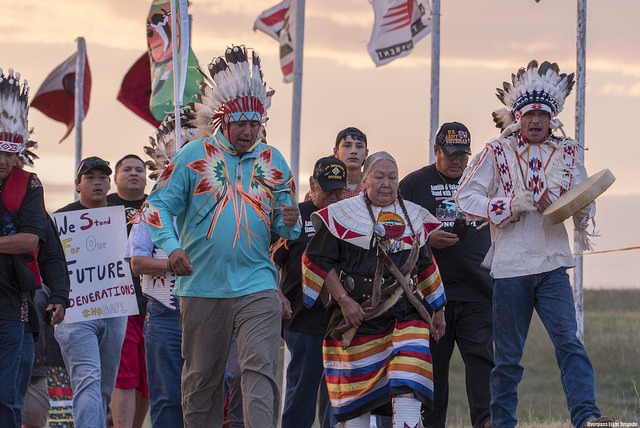 Since the summer, thousands of Native Americans, including New Mexicans, have converged on North Dakota, heeding the call of the Standing Rock Sioux to protest against the pipeline construction. Liz McKenzie of the Diné Nation (Navajo Nation), for one, felt a sense of unity with the Standing Rock Sioux Tribe when she visited North Dakota in September, she said. The 2015 Gold King Mine Spill that contaminated the San Juan and Animas Rivers and affected agricultural communities in New Mexico and on the Navajo Nation made water contamination concerns raised by the Standing Rock Sioux more than a political call to action. ”It’s not even like we are standing in ‘solidarity’,” McKenzie said. Crownpoint, N.M. is a tough place to start a business. In part, because aspiring entrepreneurs confront a tangle of challenges. If I learned one thing from the young people I’ve met while reporting this project, it’s that my daughter needs me to listen without judgment, forsaking the temptation to give advice or prattle on about my own childhood experiences. The New Mexico Suicide Prevention Coalition’s Laura Harrison has some tips for talking about suicide and loss. Coloradas Mangas works to prevent suicide in Mescalero. Instead of asking for more money to help kids choose life, he asks people to care, to help, to let our children know we’re here for them.